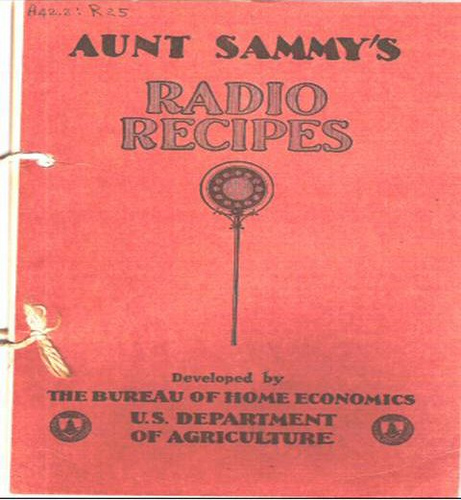 When I first got the idea to blog about Aunt Sammy’s Radio Recipes, I figured that I’d be shedding light on a totally forgotten Government publication. I remembered Aunt Sammy as the title character of an odd-sounding booklet that GPO was selling in my early days here. When I searched the Internet, though, she was everywhere. Cooking sites, old time radio sites, newspaper sites – who knew? This entry was posted on Monday, April 19th, 2010 at 8:53 am and is filed under U.S. Department of Agriculture. You can follow any responses to this entry through the RSS 2.0 feed. You can leave a response, or trackback from your own site. good books. I purchased the first few days ago and I think it is of great interest. Then I comment. 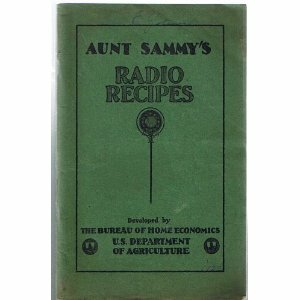 I have found a Aunt Sammy’s Radio recipes revised 1931 with a stamp on the front “From the office of William H. Wheat your congressman 19th district, Illinois” it all so has a letter with it. To a lady on real congressional paper talking about a mutual friend that they had and it was signed by W H Wheat. Dated May 27, 1942. Wow! Great find, Cherry! Thanks for sharing…. I also have one from Forrest Harness with letter dated in 1940. Pulled it out today to check on turnip recipes since we receive them in our CSA bags in the fall. It was my grandmother’s booklet. Great fun and some good ideas I might modify in some small ways. Thanks for the information. Just found an old well-worn copy at a book sale today and was wondering about it. Not a bad find for a quarter. I found alot of the things she made, I loved so much as a kid, however, a couple I’m glad she never made were the Stuffed Calf Hearts, and the Liver Rice Loaf on page 18 & 19. Yuck! LOL.. Thanks for the history and info! Aunt Sammy, creative! Good quality recipes. Not all the microwave, processed recipes I find these days! I bought the Aunt Sammy’s cookbook in 1976. It is a good resource for economical, easy from scratch recipes that an American family would enjoy to eat. Great fun! Also love the recipes! Thanks!